181 and 182. Diagonal catch or hand-gear used in large blowing and pumping engines. In 181 the lower steam-valve and upper eduction-valve are open, while the upper steam-valve and lower eduction-valve are shut; consequently the piston will be ascending. In the ascent of the piston-rod the lower handle will be struck by the projecting tappet, and, being raised, will become engaged by the catch and shut the upper eduction and lower steam valves; at the same time, the upper handle being disengaged from the catch, the back weight will pull the handle up and open the upper steam and lower eduction valves, when the piston will consequently descend. 182 represents the position of the catchers and handles when the piston is at the top of the cylinder. 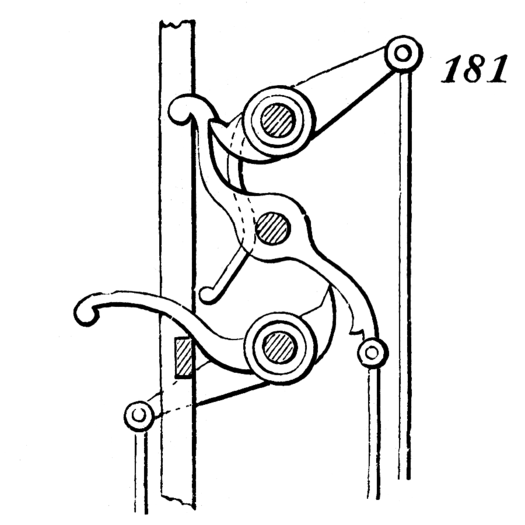 In going down, the tappet of the piston-rod strikes the upper handle and throws the catches and handles to the position shown in 181.